Mountain bikers make some turns at Kirkwood Mountain Resort's bike park. The park will be included with four other mountain bike parks, including Northstar California, on a single pass this summer. Kirkwood Mountain Resort will have plenty of brews, bikes and fun on tap this weekend. The inaugural “Kirkwood Bikes and Brews” event will be rolling and pouring its way to Kirkwood Mountain Resort, Saturday, July 29. The event will be based out of Kirkwood’s Village Plaza and will feature brew tasting, rock climbing, live music, food and mountain biking activities for all ages. The event isn’t just for having a good time, Kirkwood has partnered with Tahoe Area Mountain Biking Association (TAMBA) in an effort to support the many projects TAMBA has going on to improve mountain biking around the region. 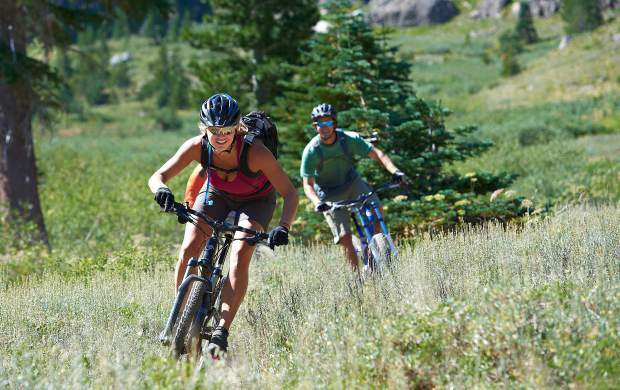 According to Kirkwood, it had been putting things together for the festival earlier this summer, but thought adding the outdoor and mountain biking element would be a great addition for Lake Tahoe residents and visitors. The event is divided into two portions, with mountain biking activities and demos from 10 a.m. to 3 p.m., and the brew festival from 3 to 6 p.m. If you’re not up for drinking and biking, a complimentary shuttle will be provided to ticketed festival-goers from MontBleu Resort and Casino to Kirkwood. The shuttle will leave at 1:30 p.m. and return at 7:30 p.m.
Before you get too many samples of brews down, there will be a lot of biking activities going on to get you thirsty. First up, from 10 a.m. to noon, is the hill climb and strider race for adults. There will be a kids skills challenge occurring from 10 a.m. to 1 p.m., followed by a kids strider race directly after. There will be an all ages hill climb at 1 p.m. and an all ages Gran Fondo ride from 11 a.m. to 12:30 p.m. Also for the kids, and probably adults too, a rock wall, bouncy house and balloon twisting will be on location. Dan Lebowitz, from Animal Liberation Orchestra, will be set up and playing some tunes at 3 p.m. with his other group, Lebo and Friends. Lebowitz has been an opening act for Jack Johnson at several of Johnson’s concerts. Once the bikes are put away and it’s time to sample some beers, you will have plenty to choose from. According to Kirkwood, there will be beers from over 20 breweries, so choose wisely and stay hydrated. With the purchase of the ticket, a commemorative glass will be provided that allows for unlimited beer samples. Tickets for adults 21 and older can be purchased in advance for $30 through Eventbrite. Tickets purchased at the door will be $35 and an activities pass, not including beer sampling, will be $20. For more information, visit Kirkwood.com.